Q: First of all, you’re not really giving away an entire book, are you? I mean, what’s available for free here on your website is just excerpts, right? A: No, what’s available here is the entire book, and it’s entirely free for e-book download or online reading. Q: But aren’t we talking about a full-length book? A: Certainly. The total word count is nearly 130,000, which, for what it’s worth, is a little longer than either Pride and Prejudice or The Adventures of Huckleberry Finn—two books, I might add, that are generally acknowledged to be passably well-written, though neither of their authors completed elementary school. Q: But doesn’t a book that long, with all the research and close textual analysis, not to mention rewrites and fact-checking, require a big investment of time and energy? A: Well, I wrote the earliest versions of some of the chapters in late 2012 and early 2013, so the whole project took about three and a half years, ate up my university vacation periods, turned me into something of a hermit, and left me perpetually under-slept during academic semesters, as I tried to give full energy to my teaching responsibilities while still finding time here and there to continue writing or editing the book. Q: And you’re giving all that time and labor away for free? A: I know—what a nice guy! Q: Okay, let’s just get this out in the open now, so we can forget about it: You got shot down by a bunch of traditional publishers, didn’t you? So you finally decided the only way to get the book out there would be to self-publish, right? A: Actually, no. Don’t get me wrong, many of our greatest works were rejected umpteen times, for any number of reasons, before finding a path to publication. An author’s having failed repeatedly in the so-called traditional publishing world is no black mark against him in my view. However, in this particular case, I never sent this book, a proposal, or even an inquiry to any publishers. Go ahead and ask them. At one moment, when I was still trying to decide what to do with it, I searched for a literary agent in the U.S. I chose the agency that looked most serious and had a list of reputable clients, some of whom I like, and I sent them a proposal. They were kind enough to respond quickly with an enthusiastic recommendation that I look for another agent. And that was it—I took that as a sign from the gods. I’m good at taking things as signs from the gods. Q: A sign of what? A: Of what I should do with the book. Before I sent anything to that one agent, I had long been musing about the possibility of self-publishing, and even of putting the whole book online for free. That one little experience in the “real” publishing world, or specifically the impure feeling I had about it, just confirmed what I already knew, which was that this book had to be done this way—self-published and free. A: The analogy I commonly use to explain it is this. Imagine that somehow or other you become privy to information concerning a terrorist plot; let’s say you overhear a conversation about the theft of radioactive material and a plan to use it to detonate a dirty bomb in a major city. You now have information that might prevent a massive attack, and potentially save thousands of lives. So what do you do with that information? Do you (a) announce to the authorities and the press that you have this information, without actually revealing what you know, and then hold out for a good price? Do you (b) sit on it for a while in the hopes that ominous threats from the terrorist organization might create a heightened level of public fear, thereby increasing the market value of your information? Or do you (c) disseminate the information as quickly, efficiently, and widely as possible, without any thought of profiting materially from an imminent catastrophe? I choose option (c). Q: But does that analogy really hold up? I mean, surely the urgency of preventing an imminent terrorist attack is completely different from arguing against a long-standing institution like public schooling. A: Well, it’s different in two important ways that I can see. First, a terrorist attack, however severe, is a sudden, one-time event, and more or less local, whereas public schooling is an ongoing destructive endeavor, damaging many generations on a global scale. Second, terrorists are essentially stupid and lack imagination, and therefore merely seek to destroy bodies, whereas modern government schooling theorists and promoters think on a grander scale, and therefore prefer the deeper victory of destroying souls. Q: Does that mean you think public education is more serious than a terrorist attack? A: Many people will likely feel, or at least feign, shock and outrage at my suggestion that public education might be the more pernicious evil. But that’s because we live in an age of nihilism and naïve materialism, in which the thought that there might be a defeat more profound and total than mere physical death is inconceivable. The men to whom I turn for guidance on such matters had quite the opposite view, because they were neither nihilists nor naïve materialists. I’m with Socrates, Plato, Epictetus, Jesus, Boethius, Dante, and Patrick Henry on these issues. There is obviously one sense in which the terrorist attack is more drastic, namely that for the victims who pay the ultimate price there is no chance to repair the damage, or to seek to prevent further harm to others in the future. We victims of public schooling, on the other hand, can still, with hard work, reverse some of the harmful effects, and may also strive to save others from future harm. But as for the severity of the harm being done, if not the finality of it, I stand by my analogy. Our obsession with physical loss, and physical pain, is part of the reason we are in the predicament we are in as a civilization. We’ve forgotten that souls are more valuable than bodies, an assessment that used to be the common understanding. Is it “Better red than dead,” or “Better dead than red”? For virtuous men and women throughout human history, that would have been a no-brainer. Sadly, we’ve reached the opposite pole on that question now. And that’s my explanation for my decision to release the book for free online, where the greatest number of people may read it with the least trouble or expense. Our willingness to give up anything for physical comfort, protection, and gratification is not an accident of time, or the result of some bad entertainment. This spiritual reduction, the precursor to tyranny, is, above all else, the product of the manmade global climate change engendered by compulsory schooling—a life-endangering alteration of the moral climate, that is. The human situation—the level of threat to humanity—is dire. And whereas terrorism is a frontal assault on a way of life, which may therefore be confronted and combated by defenders of that way of life, government schooling undermines life much more comprehensively, precisely because it is subtler and more insidious. By the time you realize you are under attack, and want to leap into action to confront the danger, you find that you can barely lift yourself out of your chair. All your strength has been sapped, over the course of years, without your even noticing it. That’s the kind of assault public education represents. For those of us who have some information about how this gradual and insidious attack is being perpetrated, this is no time for calculating our immediate material advantage. It’s time to spread the word. Q: Whatever the cause of its current dominance, the Argument from Credibility certainly carries weight these days. Don’t you worry about that? A: The trouble is that the Argument from Credibility has a little logical problem. “It’s credible because Publisher X approved of it. Publisher X’s judgment is credible because he has a big office in New York. Having a big office in New York is credible because only the really wealthy and successful can do it. Being wealthy and successful gives you credibility because it means you got a lot of people to pay for your products or services. The judgments of customers who pay for a company’s products or services are credible because they wouldn’t pay for things that were not credible. They know what they are paying for is credible because Publisher X approved of it. Publisher X’s judgment is credible because he has a big office in New York….” See the problem? Q: So you don’t worry about the appearance of credibility that mainstream publication brings? A: Sure I worry about it, for the reason I explained earlier—we live in an age in which people have been trained to place all their trust in established experts, meaning in the lords of the status quo. I worry about reaching people who, due to indoctrinated feelings of inferiority and unworthiness, have ceded their own critical judgment to the authority of society’s self-appointed gatekeepers. “Credibility,” in the modern sense of “establishment sanction,” is a symptom of the very moral calamity I’m addressing in my book. It derives from the same psychological mechanisms that have given us the many completely unfounded and ridiculous opinions we call “truisms” today, and which frequently determine our most important life decisions. It is a truism today that you can’t get a decent-paying job without a college degree—although Bill Gates and Amancio Ortega, the two richest men on the planet, do not have degrees. We tell children today that they’ll never amount to anything if they don’t go to school—like, say, Thomas Edison, Abraham Lincoln, or Jane Austen. Likewise, in this age of submission, in which “credibility” has become the weak mind’s highfalutin euphemism for “vetted by my superiors,” we say a self-published book lacks credibility. 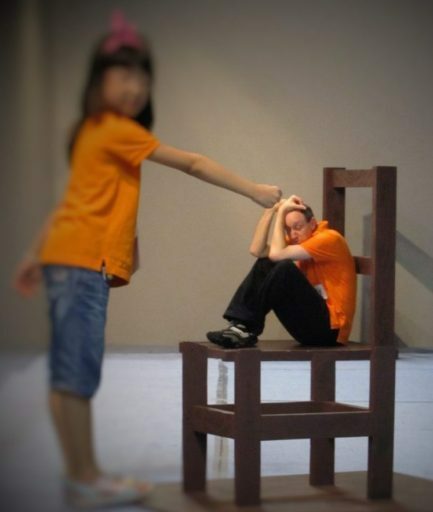 On this standard—the standard of an age formed by what I call compulsory mass retardation—Tristram Shandy lacks credibility, Beyond Good and Evil lacks credibility, The Tales of Peter Rabbit lacks credibility, Leaves of Grass lacks credibility, The Joy of Cooking lacks credibility, and A Christmas Carol lacks credibility. Each a classic of its kind, each arguably the peak achievement in its respective arena, and all self-published. I’ll take a dollop of that lack of credibility, please. Q: Could you summarize the book and its purpose in twenty words or less? 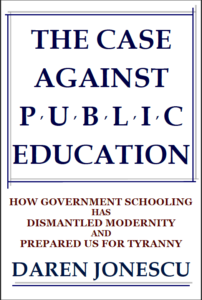 A: Government schooling has dismantled modernity and prepared us for tyranny. Stop allowing the state to raise children, right now. Q: The first part of that comes from your book’s subtitle. Don’t you think some people might be frightened off of your argument by that somewhat Cassandra-like tone? A: The original Cassandra’s fate, imposed upon her by Apollo, was to be a seer whose prophecies, though true, would never be believed by anyone. I’ve tried to honor Apollo in my life precisely to avoid such a curse. I’m testing our relationship with this book. Here it is—the hard and unvarnished truth as I understand it. Do people have ears for such hard truths anymore, or will Apollo mock my efforts, making me a real Cassandra in the full sense? We shall see. In the meantime, I can say that if I believed the only way to avoid frightening readers off were to obscure or minimize the seriousness of our civilizational danger by using muffled, milquetoast language, then I wouldn’t have bothered to write the book in the first place. I would know that it was too late for arguments, and simply let the collapse play out as it will. But I continue to harbor some hope that there are still a few people out there who take the relationship between ideas and politics seriously, and who remain receptive to arguments, however inconvenient and painful the conclusions may be. I’m writing for them, not for people who just wish we could all calm down and stop taking everything so seriously. This is no time for people who refuse to take life seriously. Or at least I have no time for them. Q: How would you measure success with this project? What would make you feel the whole effort had been worthwhile? A: Every conscientious teacher, deep in his heart, hopes to change the world, and gives his total effort toward that end. But every teacher also learns through experience, mostly of the disheartening kind, to measure his own practical success in individual triumphs, and to leave the fate of “the world” to the heavens. For example, if one student in my class shows me that he or she has really discovered something new and life-enhancing inside, and is applying that discovery to his or her real life outside of the class context, then I am gratified. The effort wasn’t wasted, even if I fail to see any such breakthrough with most of the other students in the class. On that principle, then, I would say that no one would write a book like this without holding out some hope that his effort might change the world, but in practice if even one family decides to rescue its children from public school after reading my book, and actually follows through and raises the children toward intellectual freedom and moral independence, then I’ll know I’ve achieved something worthwhile. This is another lesson I’ve learned from the example of Socrates: You can’t win ’em all—but that must never become an excuse for ceasing to try.